The church organ dates from 1870, possibly earlier and was built by John Nicholson, who founded the firm of Nicholson & Co. (Worcester) Ltd. St. Wulstan’s church was built in 1862, so the organ was completed only 8 years later, but it is not know if the organ was installed in the church immediately after it’s completion. The organ has two manuals, (Swell and Great), tracker action and fourteen stops. In 1971 a fund was started by Father Everard Faulkner and completed in 1974 by Father Joseph Coombe-Tennant, for the thorough overhaul of the instrument. Most of the work was done by Nicholson’s. There were not sufficient funds available in 1974 to renew the Trumpet stop on the great organ, which had fallen into serious disrepair, but in 1980 a personal legacy from Mrs Florence Owen, who attended St. George’s Catholic Church, Worcester, to a member of St. Wulstan’s Parish Church, was used to replace the Trumpet stop by a Mixture. It would have been very costly to renew the Trumpet stop and it was felt that a Mixture would not require such frequent tuning: a stop was required which would add to and enhance the Great chorus, and the organ-builders recommended a Mixture. 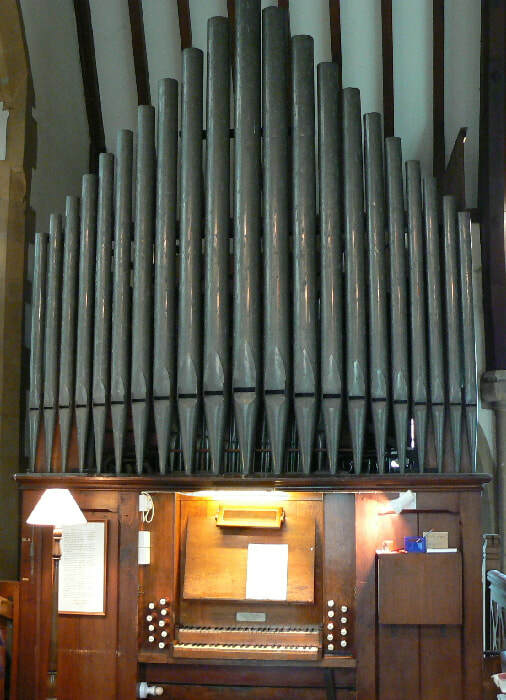 In 1981 a further improvement was carried out when an 8ft Bass was added to the Swell organ. Previous to that, the bass was ‘borrowed’ from the pedal stop, the 16ft Bourdon. The arrangement was an awkward one, and musically unsatisfactory, but was done originally to save costs: a full range Swell organ would have necessitated a much larger Swell box to accommodate the extra pipes. These last two improvements were carried out with the approval of Father Edmund Carruth, successor to Father Joseph Coombe-Tennant. The work was done by Nicholson’s.